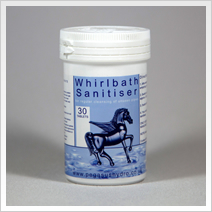 The Pegasus Sensations Whirlpool Bath is active. Sensations control button is pressed & held down for approximatly 3 seconds to shut down the system. The system has now completly stopped. Bath filler dial gets turned (clockwise) to activate the pop-up waste. Gravity takes effect & the water drains from the bath & 4G pipework, out through the pop-up waste outlet. Some residual water droplets may still remain within the pipework at this point. The HOT air blower automatically gets activated 20 minutes after the system is switched off. HOT air is blown around the 4G pipework to dry off any remaining residual water droplets. 4G pipework is now toatlly drained of any water. When the bath is emptied, the pump and pipework will drain completely, but just to make sure that every last drop has gone, the heated blower is programmed to automatically purge the pipework of any remaining droplets 20 minutes after you have emptied the bath. 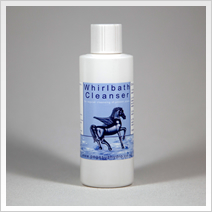 Maintenance consists of flushing the system with our whirlbath cleanser six or seven times a year depending on usage - we include a two month hygiene pack with every system. 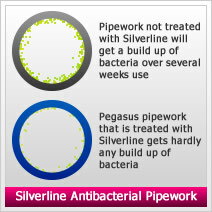 Silverline Antibacterial Pipework - This is the pipework we use on all our 4G whirlpool systems. It is impregnated with silver & has been laboratry tested for active bacteria reduction within the pipework. Silverline anti bacterial pipework is a big plus on the hygiene side of our whirlpool baths & has been proven to greatly reduce the possibility & is resistant to skin diseases such as Legionnaire’s.